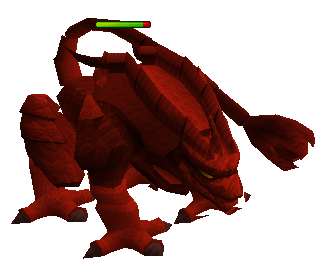 The TzHaar Fight Cave is located in the city of TzHaar, and it's here that you'll be able to participate in the Fight Cave Activity. It's a game of survival -- whoever lasts the longest is the winner. The entrance to the Fight Cave is found a short distance from the TzHaar bank. If you plan on lasting awhile in the cave, you'll want to have around 100+ Combat, a high Prayer level and some food and Prayer Potions. As you progress through the Fight Cave game, the monsters will keep getting stronger. The longer you last, the more TokKul you'll receive later. If you die, you won't lose anything; you'll end up outside of the cave. The cave itself is mostly just a large room filled with enemies. 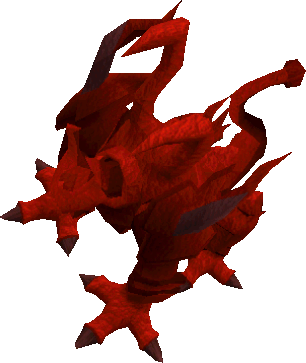 It's multi-combat, and the area is similar to the TzHaar city. 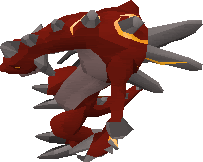 Can hit up to 40 Damage, drains 1 Prayer Point each time it hits you even if it does no damage. Can hit up to 43 damage. More accurate than the Tz-Kih. Can hit 70 Damage, hits 10 Damage every time you hit him 2 times also acts as though it is wearing a Ring of Recoil, that only works when you Melee. So if you hit 100+, he hits you for 20. If you hit 10-100, he hits you for 10. He will not hit you if you range him. Can hit up to 250 Life Points. It can heal 100 Life Points for every 3 turns it takes while you're meleeing it. Can hit over 900 damage. Uses a combination of Mage and Ranged so watch its legs to see what Prayer to put on. By killing it you get the Fire Cape.